The kinship of beer and board games is a close one here at Collider Towers, to the point of the occasional ale-cardboard interface incidents, so when Board and Dice contacted us to ask us to playtest Beer Empire, we leapt at the chance faster than Twitter followers band together to ostracise neo-conservative policy. To add more fun to the proceedings, this playtest was conducted through the medium of the Internet over a session of Tabletopia. Once Jon and I got over the novelty of ski-ramp building from the multitude of components and lack of complex physics engine, we settled in for an evening of craft ale brewing, complete with hipster beards, pipes and man-buns. Beer Empire is, like a good beer, simultaneously complex and straightforward. It took Filip a full hour to explain the rules and how to play, which I must admit put me in a slight trance where I began to contemplate the benefits of drinking bleach and what magic delights could be found by poking a fork into the electric socket. Once we started playing the game however, it flowed like a syrup enema and was just as easy to play. 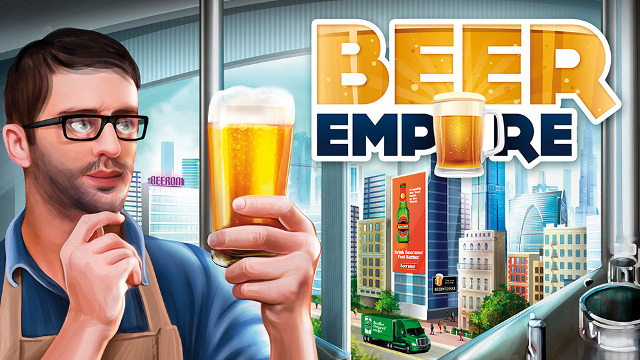 The premise of Beer Empire is, as it says on the box, to make beer. You own a brewery and are trying to make your mark on the world’s market by way of careful ingredient selection, paying attention to the market, trends and desire in addition to trying to impress the fussy tasting ponce at a local beer festival. With an impressive number of options on offer, it quickly became apparent why it took so long to explain the rules as each option has an influence on the others. Ultimately you’re trying to gain Victory Points, which you mostly gain directly during the brewing process. The game consists of 6 turns, each of which contains several rounds. Every 2nd turn, there will be a beer festival so you get time to brew two beers, one of which you can choose to submit to the festival to be judged. 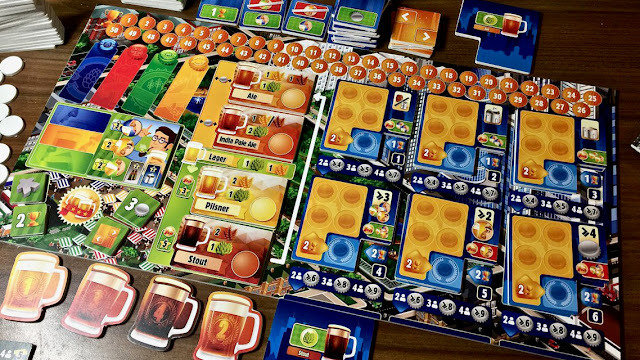 The turns are made up of ingredient selection, brewing beer, getting rewards, bidding on the markets and then planning what your layabout workers will be doing in the next turn. There’s a lot to consider – the markets probably being the most significant part of all of this. There’s 6 to choose from, each of which represents different aspects of demand. For example, one market may reward the brewing of beer in an open fermentation process, another may reward you for using bottles instead of a keg. The bidding is a closed auction and each player bids with bottle caps – the current leader of each market gets an extra VP bonus if they satisfy those conditions when they brew. The beers have attributes, aroma, taste and colour. Caps and other attributes are awarded during the brewing process itself – each ingredient will come complete with a benefit and/or drawback of that ingredient. For example, it may give you additional flavour, but have a negative effect on the aroma or it’ll award you caps for that ingredient, but make the beer look like it was dredged from the river Mersey and left to stew. The attributes are helpful if you choose to submit your beer to the festival for judging as they can give you Festival points. Which, like a particularly well-groomed hipster, segways me to the Beer Festival. Submitting your beer will put you in competition with anyone else who chooses to compete and the competitors will receive Festival Points based on the attributes of the beer, whether the beer is “trendy” (I’m looking at you, Brewdog) and whether the beer used favourable brewing techniques unique to that particular judge – for example, the judge may prefer bottled beers brewed in an open fermentation process and the current trend is “Stout” so if you’ve created some kind of foosty mud in the bathtub and chucked it into a Timotei bottle, you’re probably going to score better than a carefully crafted IPA lovingly matured in an Oak cask. Which leads me to the entertaining element of the game, a subject we stumbled on during our session. The fact that you can be rewarded for brewing terrible beer is a real thing and rather true to life in a world where Carling and Tennents Super exist. However, it also highlights one of the only negatives of the game – the Festival itself feels a bit “token”. Festival points don’t translate into Victory points – if you win, you’ll get a couple, but nowhere near as many as crafting a decent brew. So it’s almost worth your time focussing on the brewing instead of trying to satisfy a chinless wonder who wouldn’t know finings from a demijohn. So overall, the functioning alcoholics here at Polyhedron Collider rather enjoyed Beer Empire. It’s a great mix of worker placement, strategy and interdependency and there’s even a chance to screw your opponents by grabbing much-needed resources even if you don’t need them right away. No, I’m not Bitter that Steve’s strategy proved more Stout than mine – we had a Barrel of laughs playing Beer Empire. And yes, I’m getting my coat.